I was looking back through your build photos and saw your oil cooler mounting. Aren't you concerned about the cooler being damaged by stones & dirt being thrown off the rear tires at speed? Hey Neil - I have full wheel well closeouts for the rear. Second last photo in this blog post shows the shield installed. Once the rear clam comes down the oil cooler is fully closed off from the rear tire. Thanks, Cam. I did not know that there was a shield between the cooler and the rear tire. I've gotten around to installing my rear wing. 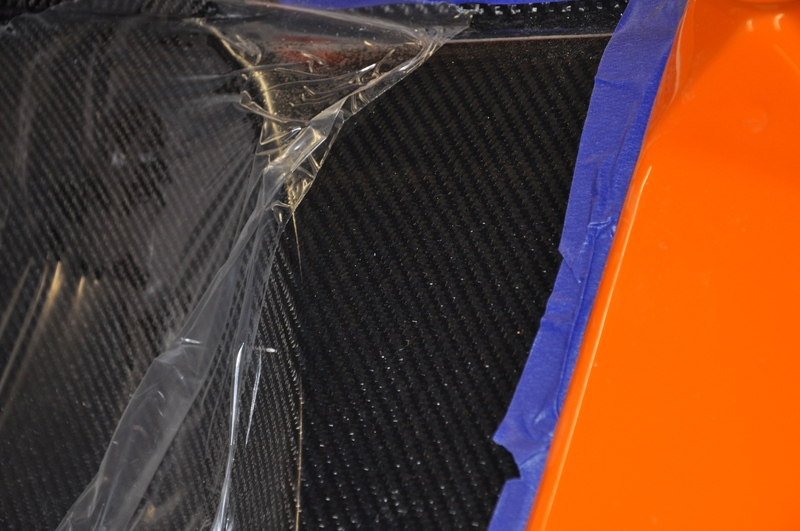 I ordered the optional carbon wing which uses the Selig 1223 airfoil. There hasn't been a whole lot of discussion concerning aerodynamic setup of the car, front/rear aero balance, etc. 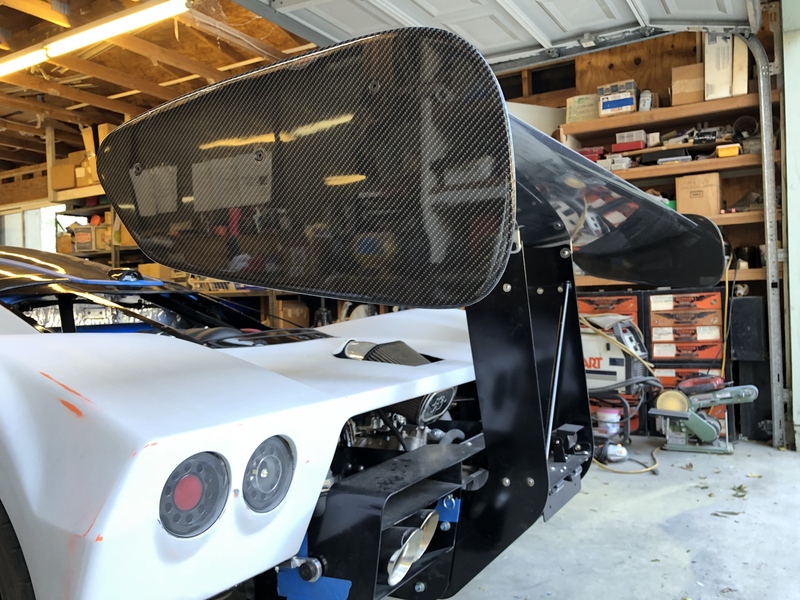 I'm concerned the car will have too much rear downforce and not enough in the front to balance; so to start with I'll be running the wing at an angle of ~0-deg to start then I'll dial things up as I get more comfortable with the car. For those curious about the mounting positions and what angle of attack they produce I have a table on my blog. For those wanting to set it at ~0-deg it's the front bottom and top rear mounting holes you want. 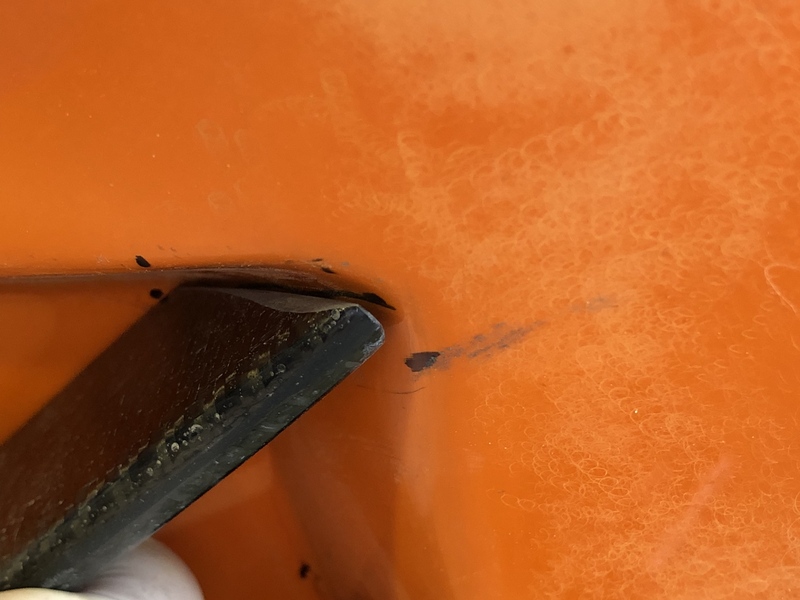 I was a bit concerned with using the factory supplied endplates; they're 1/8" aluminum and probably a nice way to cut someone if they bump into your car. 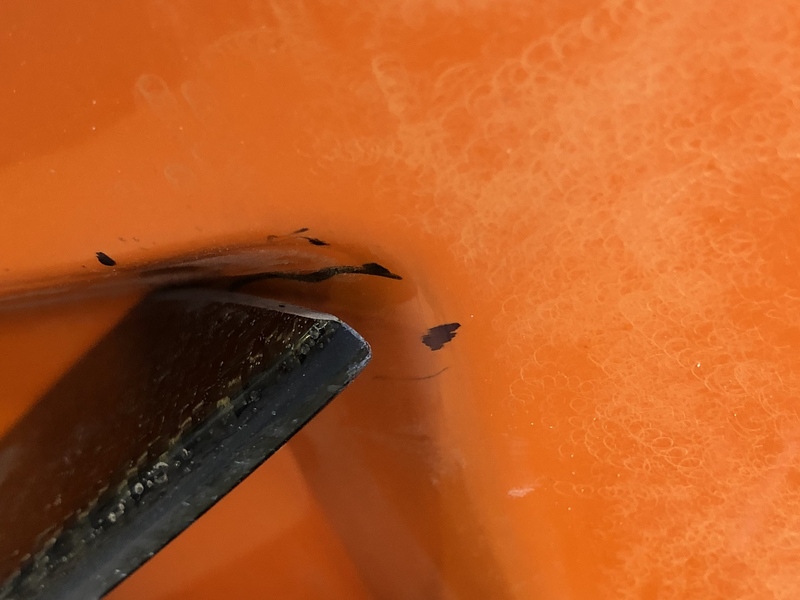 I'd say if someone accidentally bumps into your rear wing they ought to get cut! 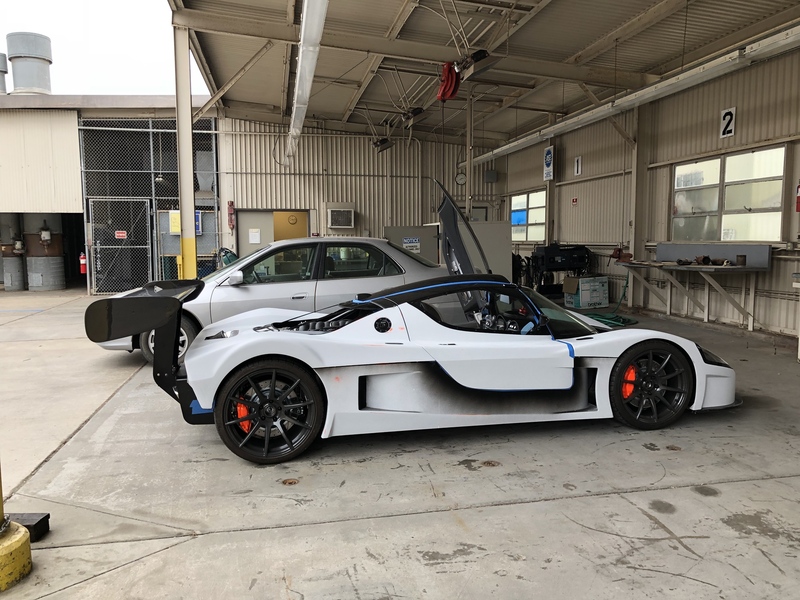 I mean ... no, that would be a bad thing ... so to avoid having to call my insurance company I fabricated a set of end plates using fiberglass and carbon fiber. They have nice radiused edges so there'll be no cutting today! Thanks to Howard for hooking me up with templates for the older endplate design. These are probably less aero efficient than the big L-shaped ones the factory supplies - but I find these are much more pleasing to look at. 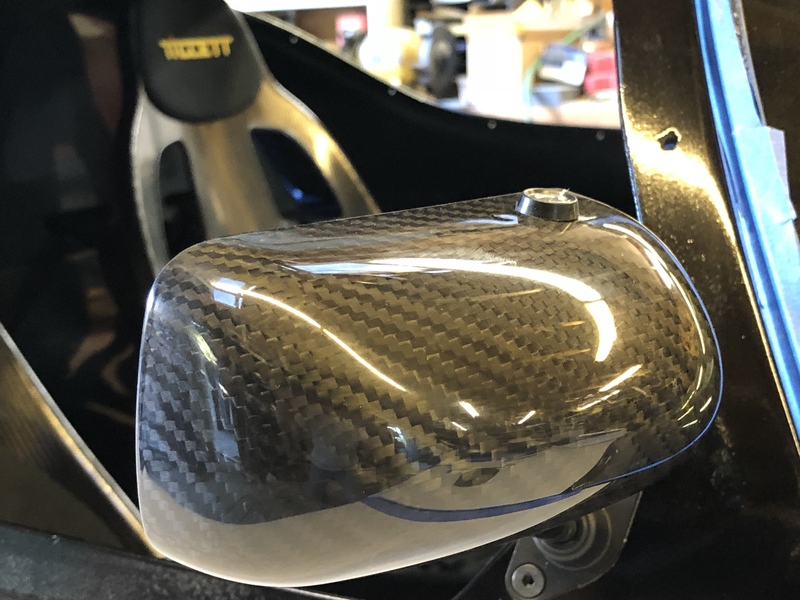 For those wanting the deets on wing angle click here! Thanks Mike! Appreciate the nice words! All very good Cam, including your craftsmanship. Impressive. But what happened with your canards? Are they deleted? Johan - with regard to the canards, I have not installed them yet. 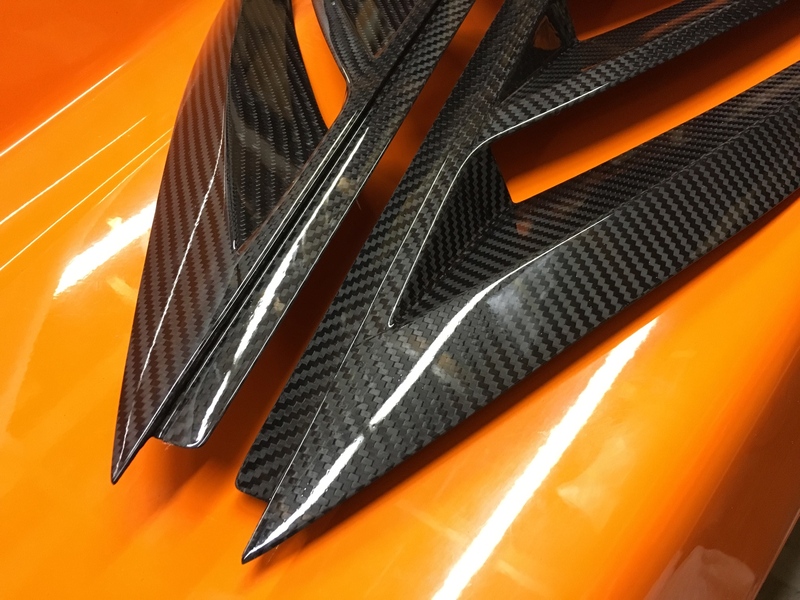 I've fitted them but I felt the quality of the carbon fiber was not to the level I wanted for my car. 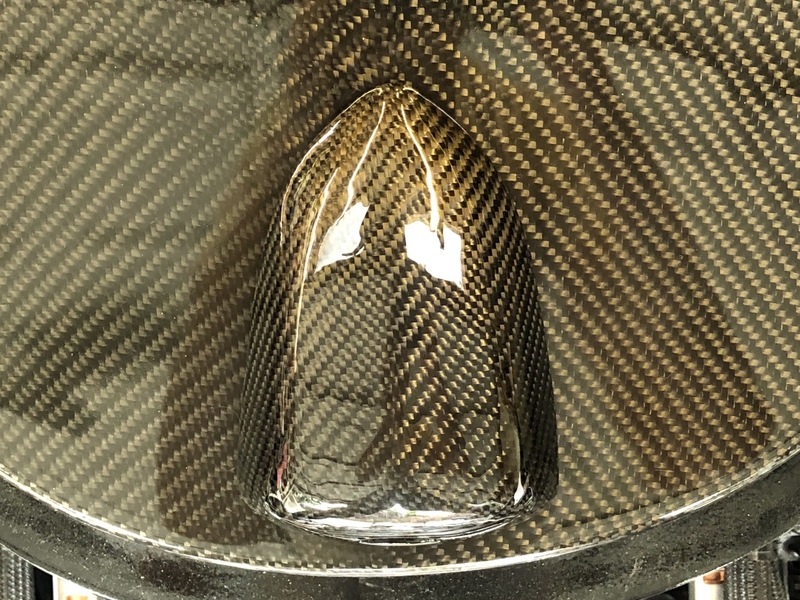 The canards are a very unique detail and I think it's something people will look at and say "ooh, that looks neat" and take a closer look. When taking a closer look the carbon work is ... not good (IMHO). I'm super relieved that those who have reviewed the parts are happy with them - I think they're really nicely shaped. 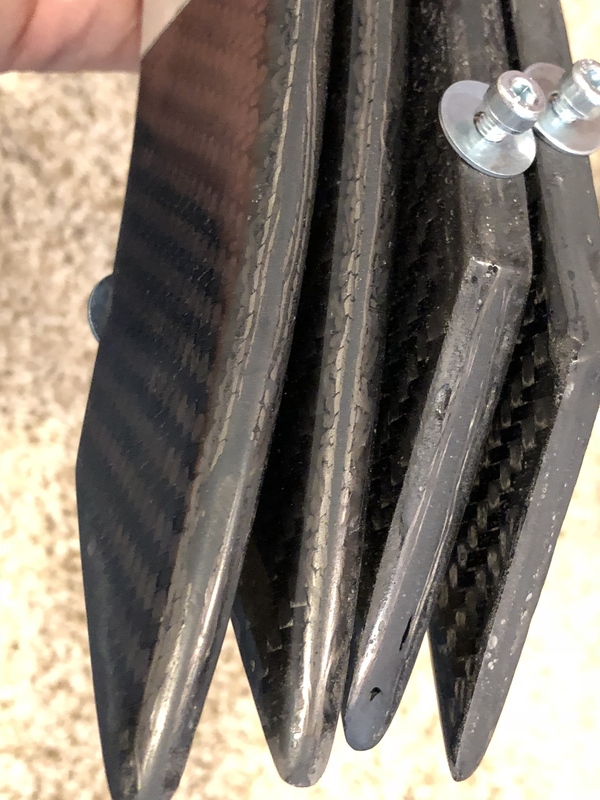 However, I already have a lot of carbon fiber on my car and I feel like the carbon work on these pieces isn't in alignment with what I already have. 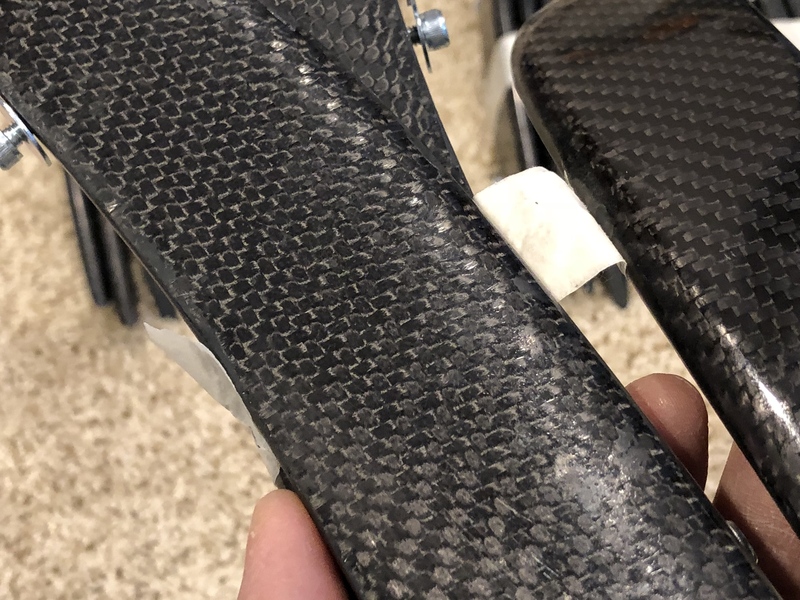 Your carbon weave orientation being incorrect is not unusual - it doesn't appear there was any effort to align the weave to get a matched "chevron" pattern like I have going down the center of my car. Based on what I could tell from the parts I looked at, it was random whether the pattern was going "in" or "out". Everything above was made by different manufacturers/techniques and the outcome is visually very nice in each case. Of course when you zoom in, any flaw will appear large - but you don't need to zoom in to see the flaws on these parts. I'm not saying my work or anyone else's is the gold standard, but the quality of the canards stands out in comparison to everything else. So ... I haven't installed them yet because I don't think they're a match for my car. I will be repairing the wall damage and I'll attempt re-skinning my pieces to improve the weave appearance. It's going to be a tricky piece to do because of its shape and how tight the fabric will have to fold/stretch. After my car is "done" and I have some time, I'll come back and give it a shot. Just too much going on to stop and work on this particular project. I've been on the fence about whether I should say anything about these parts because it seems like everyone likes their parts and I didn't want to put any negativity out for these parts and for the manufacturer. I feel a certain responsibility for having coordinated the group buy and I've been struggling a bit with how I feel being in that position, given the outcome. 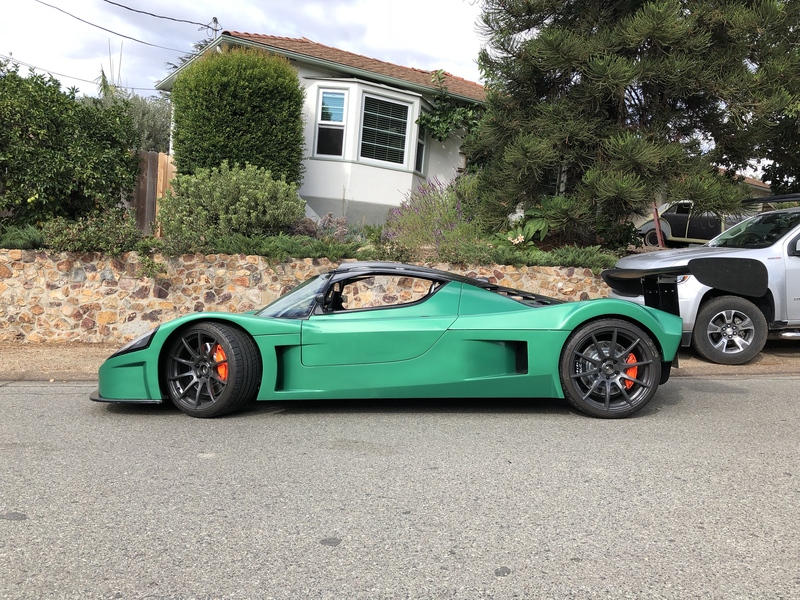 I didn't see any close-up photos of the parts before we ordered so I believed they would be of a quality on par with "Chinese carbon" - I believe those APR mirrors and several other carbon pieces I have for my other car were Asia sourced and I figured that was the minimum bar, so to speak. 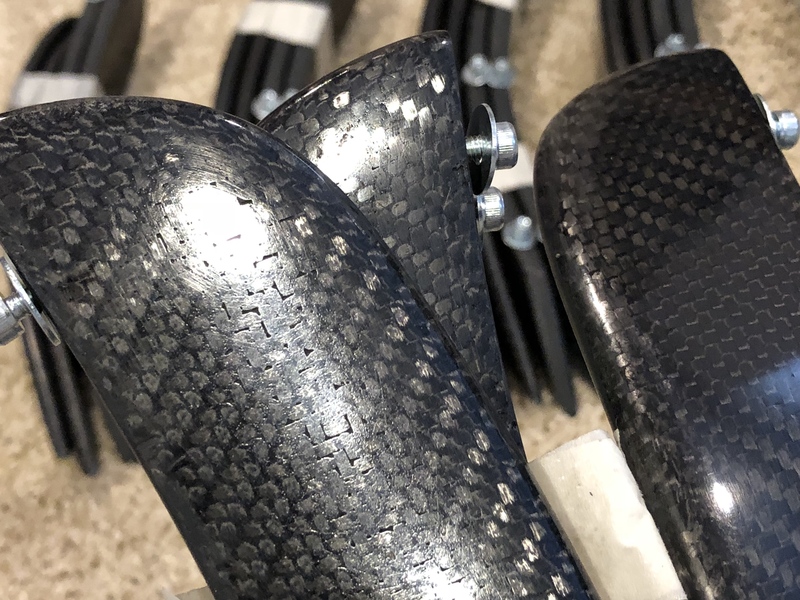 Heck, my China sourced bicycle frame cost less than these canards and my frame is virtually flawless and is a structurally stressed component. I hope everyone who participated in the GB is happy/satisfied with their parts and that my own comments don't change that opinion. I understand I'm way OCD about too many things and I wouldn't be surprised if someone called me "too picky". However, I think it's good I've posted the above photos so any prospective buyers will have them for reference and there won't be any misalignment of expectations. First day of having my SLC completely road legal and it rains. In San Diego. WTF? 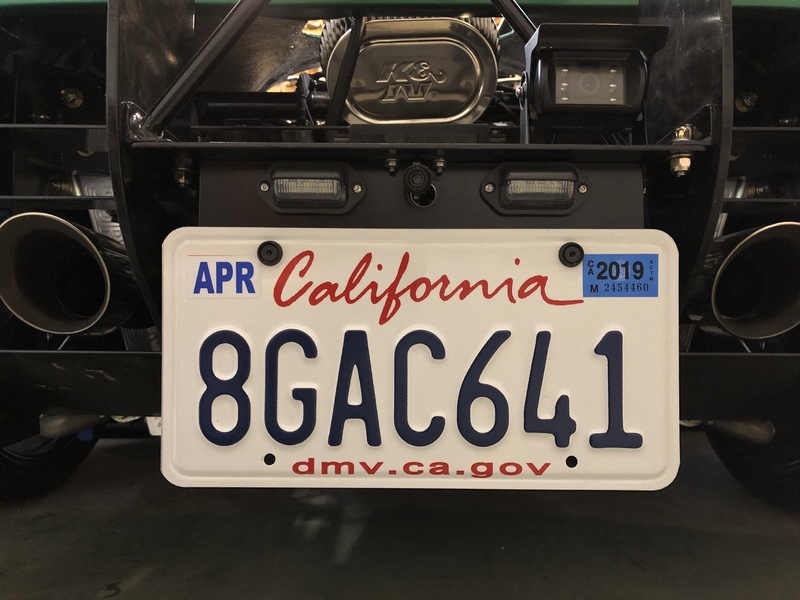 In California there's a legislative bill called SB100 which allows for 500 cars per year to be registered under a process which allows the vehicles to become smog exempt for the life of the vehicle. This is primarily intended for builders who construct some type of road vehicle at home and not for a low volume vehicle manufacturer. 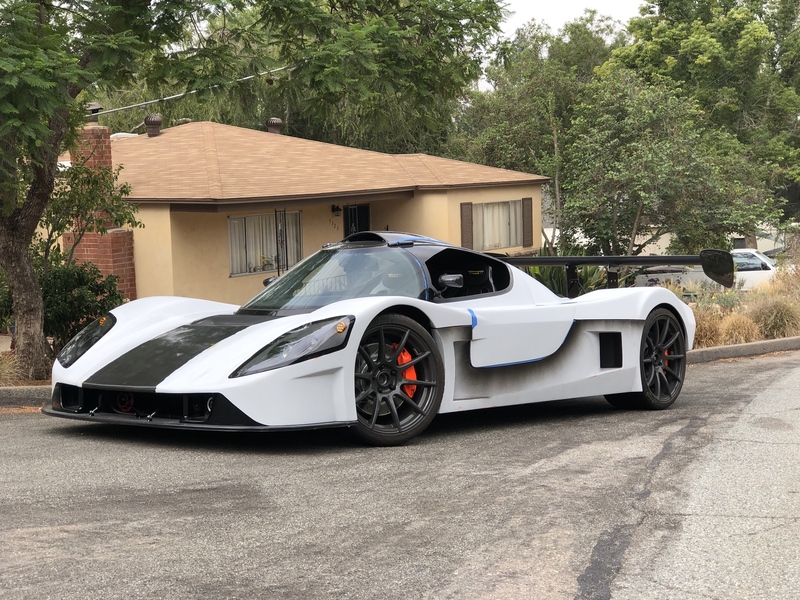 Any SLC in California will need to go through this process if it's to be road legal. Thanks to Howard and Rob for chatting with me over the phone as I pinged them about their own SB100 journeys. While the process isn't new, it happens so infrequently it's common to encounter roadblocks along the way. I got some great pointers before having to get on with this process and I consider myself fortunate for having a relatively smooth time. Go to DMV, recommend you make an appointment (or go in on a Saturday afternoon)! Have REG 343 (application for title or registration) form filled out. Have REG 5036 (statement of construction) form filled out. Pay any outstanding taxes (have your receipts organized or you will not have a fun time). If they don’t call Sacramento, insist that they do and pull an SPCN # for you (you will receive the actual form in the mail after a few weeks). They should give you Form REG 124 (application for assigned VIN plate), with the top portion completed by them. This form is required for you to proceed onto the next step. DON’T LEAVE UNLESS THE TOP PORTION IS COMPLETED BY THEM! Make an appointment to visit your nearest CHP office for a vehicle inspection. Visit the CHP home page and find your nearest office. I was told you MUST go to the office with jurisdiction over where the vehicle will be titled. The car must be “complete” but doesn’t have to be running for this step. Have all your receipts and paperwork ready. Be able to identify engine and transmission serial number (if they’re visible). Make it easier for them and highlight which receipts are for the vehicle/kit, engine, and transmission. Have a location picked out for where you’d ideally like your VIN plate located. CHP will complete form REG 124. You’ll need this and the official SPCN form mailed to you directly from DMV (the Certificate of Sequence). Call 800-622-7733 and make an appointment to visit an emissions referee. Have all your paperwork ready – super organized, labeled. The more documentation (receipts) the better! Verify your fluids are topped off – coolant & oil. 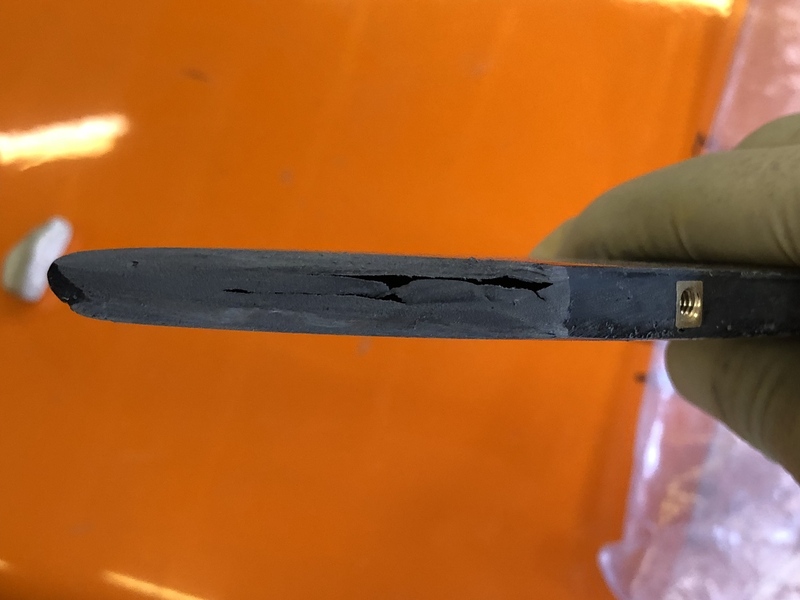 Review your PCV setup – for an LS3 which uses an orificed hole in lieu of a valve you’re likely to be OK (but I’d recommend having a ghetto-fab PCV handy just in case). At a minimum, you’ll have to have some type of CLOSED PCV system. I’ve also heard that one inspector reviewed the HOSE itself to verify it was appropriate for PCV use. Know how everything is routed and be prepared to answer any questions pertaining to your PCV setup. Select several photos of your build as you progressed and print these out. They’ll want to verify that YOU did the work to build the car. In my case, there was particular attention paid to the engine and installation of said engine. Luckily I had included a photo of the engine as-received (just unwrapped from the box) and another of me lowering the engine into the chassis. 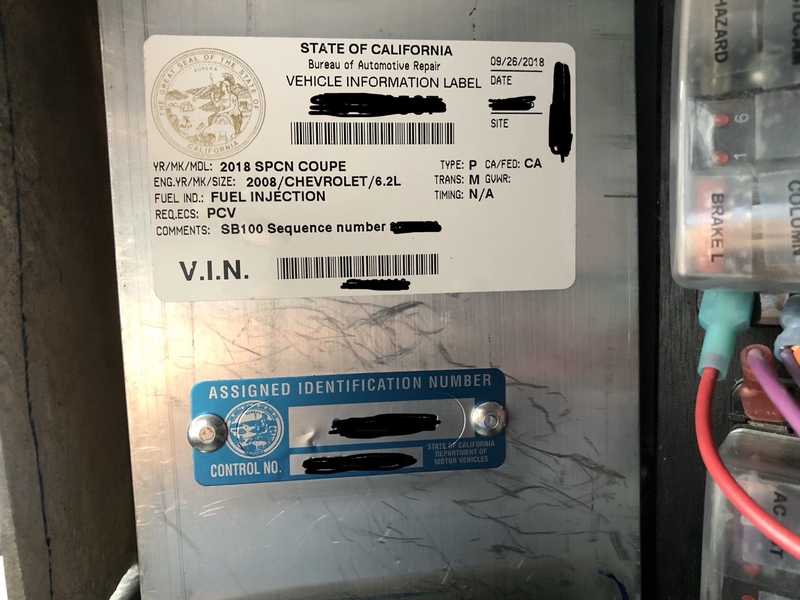 The referee’s supervisor wanted to verify that I had done the installation, or that there was paperwork for the engine installation if someone else had done it. Wait in line, turn in all your forms, collect your plates & tags! 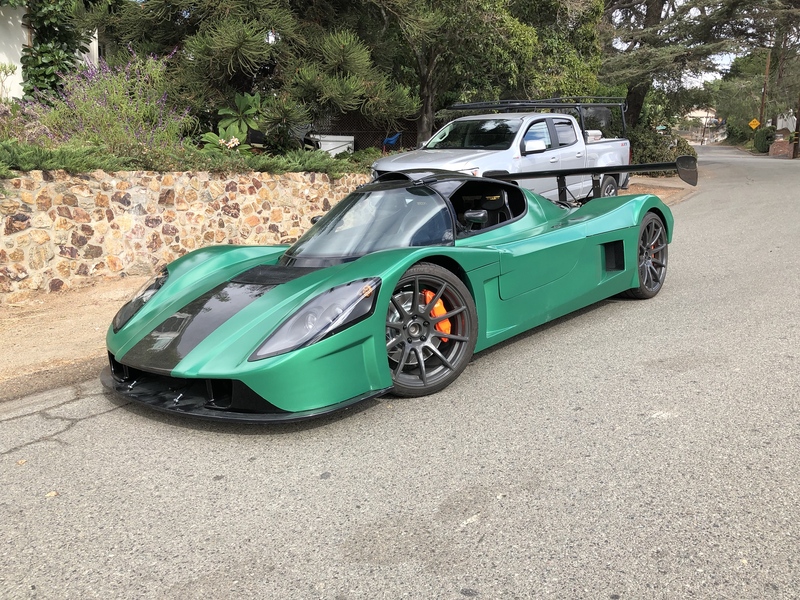 So SLC chassis #269 is now road legal. Seems a bit anti-climatic, doesn't it? A short post for today. I'm done! I'm officially out of my father-in-law's garage and the car is AT HOME. 'Well worth all the time, effort, and ...uh...$$$$$$$$$$$$$$$$$$$$$$$$$$$$. Cam, the car looks fantastic and enjoy it in good health. 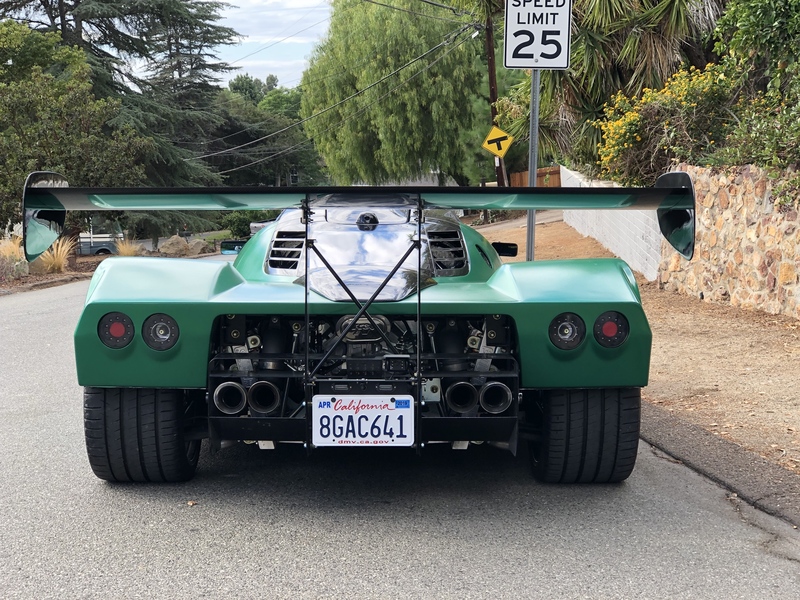 Thanks for sharing your build experience, it was a lot of fun and informative to read your updates on gt40s.com and your blog. Outstanding effort! It's been fun watching the build and it'll be fun to read about your experiences as you get it on the road more. Thanks for the kind words guys, very much appreciated! Chris - I didn’t track my hours formally but I worked on the car fairly consistently. I guesstimate about 2400 hrs. That includes time for trips to the hardware store/getting raw material, etc. 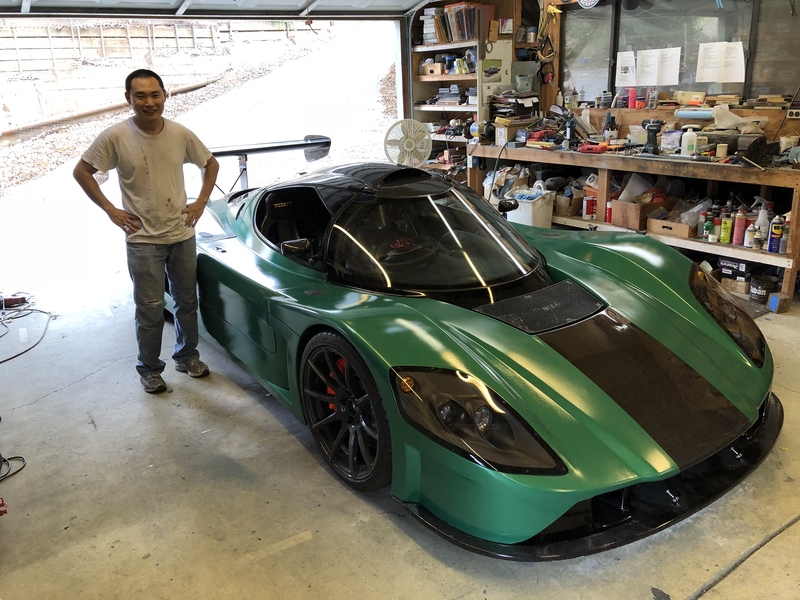 it also includes the various distractions such as learning how to work with fiberglass and carbon fiber - so it’s a decent all up number from start to finish. There would be days where I sat there for 3 hours just to do 1 hour of work. This is my first component car. Prior to this I’d done your standard bolt on modifications, rebuilt engines, etc., but basically very little fabrication since my days in college. Congratulations, A stunning build. It was a pleasure to follow your detailed postings and blog. Enjoy the ride! It's plastidip. The white was primer. I'm leaving it in plastidip for a year so the body can season, I'm sure it's going to crack. Cam - outstanding job of documenting an incredible build. I can't count the number of times i have gone to your blog for reference. I think you hit it out of the park with build quality and choice of options. Enjoy the driving! 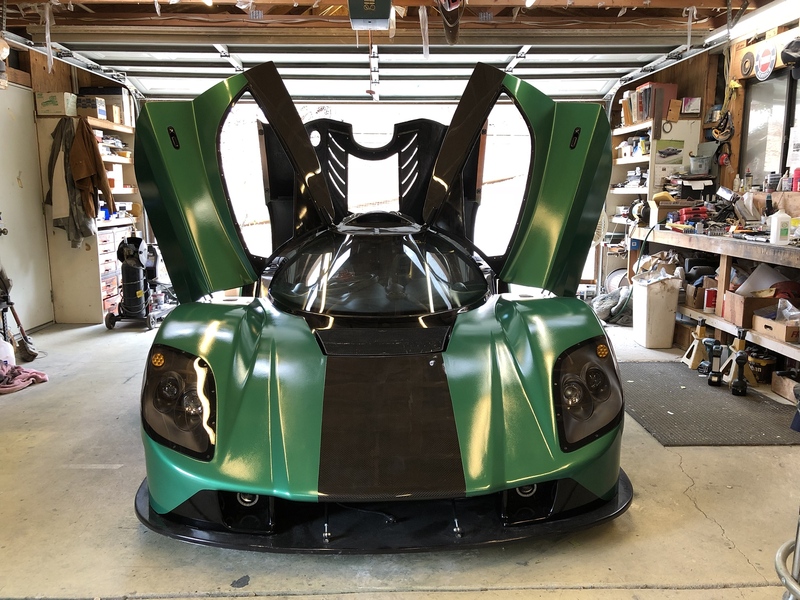 An appropriate time to post this blog update - I plastidipped my car NiO Green. I got real crazy a few years ago during DYC.com's Black Friday sale (thinking I'd slam this SLC together and needed paint soon!) and bought a bunch of plastidip. 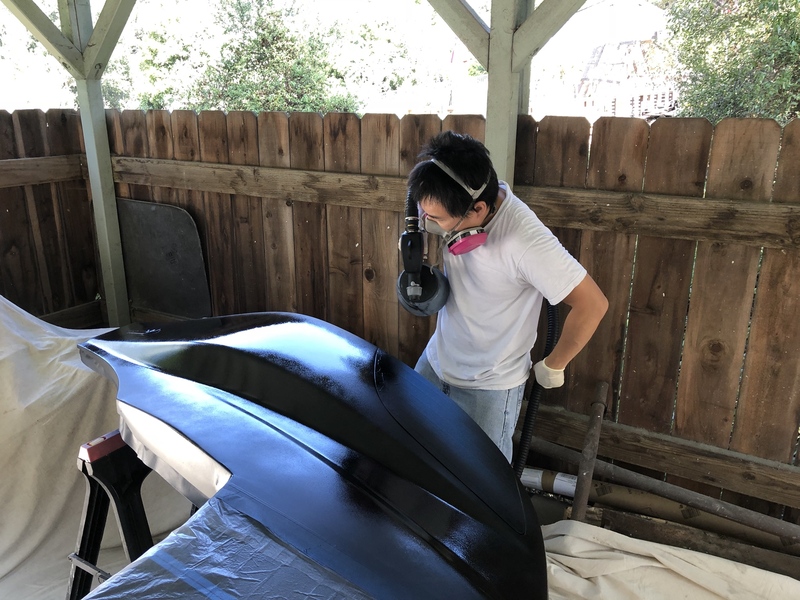 The stuff intrigues me and I think it's a good solution if you want to hold off on actually painting your car till the body is fully seasoned. I know I did a lot of amateur hack job mods to the body and with time I'm sure cracks will show. So I'd hate to invest the money into a nice paint job now only to have to blend or re-paint a year from now. Plus this gives me the opportunity to try out a few different colors before I have to make up my mind. I had originally wanted to go one direction with color choice but after having been through this build I've had a change of heart - I think. Anyway, the stuff is pretty easy to use. My first plastidip job is OK, but there are obvious flaws. With practice I'm sure the quality of the work will improve - this was literally my first time touching an HVLP gun. Bob was there to give me pointers but all the mistakes were mine - and there were plenty! On the very first coat I screwed up. I got some real heavy runs going that were sure to be obvious. We stopped and let things dry out then hit it with Naptha to dissolve some of the errant dip. It looked ... ugly ... ! The good news is after another coat or two of the base coat this issue was completely invisible. Phew! After laying down 4 base coats of black I put down 5 coats of NiO Green. I had some clogging issues with the gun during this portion of the spraying and I believe it led to the creation of a bunch of "nibs" of dip, kind of like little boogers. I had to stop halfway through the 5 coats, sand them down, then spray again. As with the black base coat, the sanded areas went away with another layer of green. This plastidip can be really forgiving! Unfortunately I didn't sand away all the boogers and find I've got a few small areas that are snotty. I followed up on the green with 2 coats of DYC's DipPearl topcoat. I don't have my DSLR handy so it's just a few crappy iPhone photos for now. As Alex points out - there's a good bit of orange peel. On my test samples I got a really glossy reflective finish - with the final job it's a lot more satin than what I'd gotten before. I suspect it may be due to not enough time between spraying the last green coat and the top coat. When I sprayed my samples it was SUPER hot and everything dried very quickly. It was less hot when I sprayed the entire car. When you mix dip with top coat 50/50 you get a satin/matte finish - pretty similar to what I ended up with, though it's more toward glossy than it is matte. If you believe the marketing, DYC's latest "Performance series" is supposed to spray a lot better and have less orange peel. You can step up to their Autoflex line which has very little orange peel, almost paint-like from what I've heard. I've learned a TON doing this first dip job and I'm looking forward to trying it out again. As with so many things, it's all in the prep. Getting the masking setup correctly and well will produce a much nicer job (duh). Now that I know how the product behaves I'll be better prepared for the next dip. 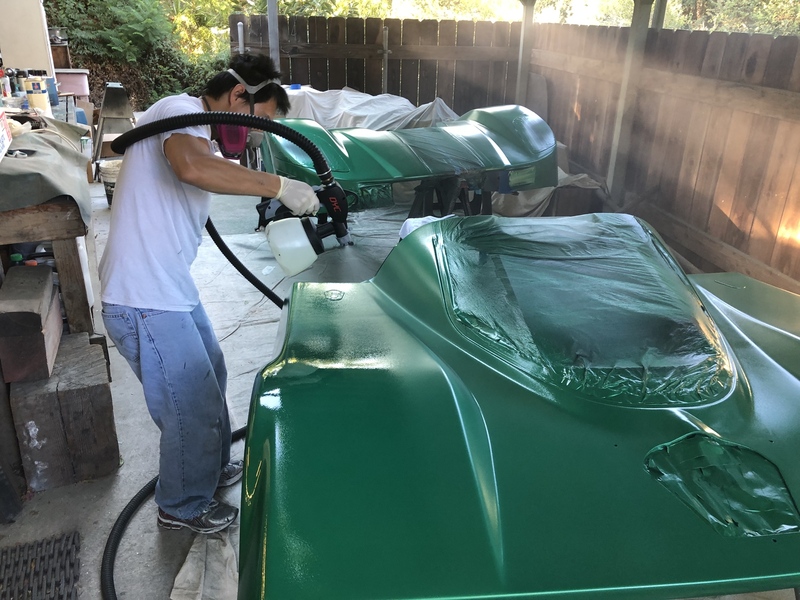 One huge word of caution - the DipPearl topcoat generates a lot more overspray than the colored plastidip. The topcoat also has some wicked solvent-like abilities and WILL damage any paint/clear coated surface it touches. 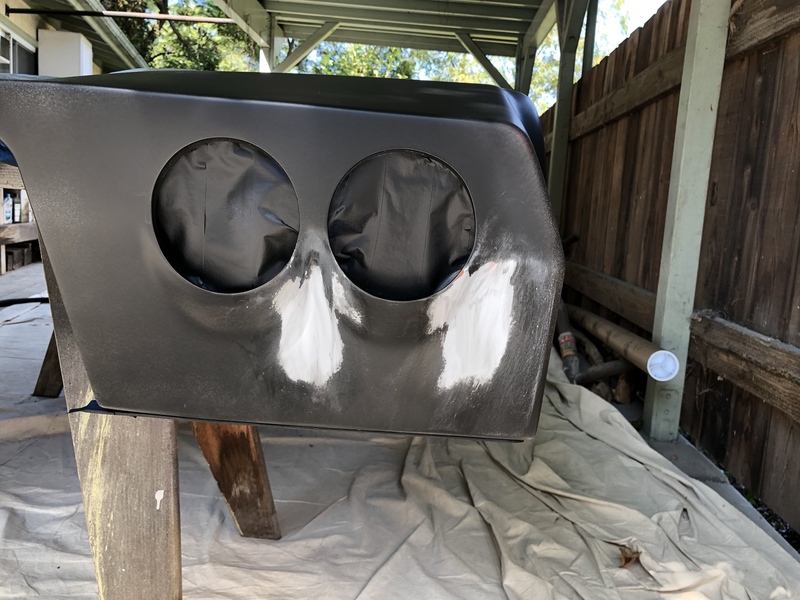 So if you've mixing it up as I've done, be sure to mask very well - I suffered some clear coat damage but luckily it was in an area that's covered up once the windows are installed.